An MP claims her constituency suffered a lack of funding as the last census did not record its population properly. Labour's Fiona MacTaggart said Slough's immigrant population was growing, with 531 children from 53 countries attending the town's schools. Mrs MacTaggart said the decision to axe the advertising campaign for the 2011 census due to cuts as "pretty stupid". The government said it was working "very hard" to ensure problems of undercounting were not repeated. Assistant Government Whip Stephen Crabb added that 35,000 field staff were allocated to areas where it had been difficult to get responses to the national census in the past, while there would be a greater effort to collect outstanding forms. 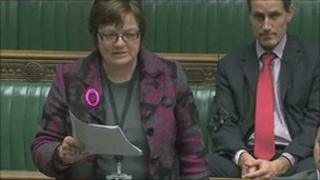 Mrs MacTaggart, speaking in the House of Commons, said: "Can you make sure that materials are available and are clear? "Slough has volunteered to translate certain materials but the Office for National Statistics hasn't agreed them." Mr Crabb said the accuracy of the census on 27 March mattered "very much" as it was used to allocate billions of pounds of public spending every year. He added: "The Office for National Statistics takes the census extremely seriously and is working very hard to ensure that the problems of undercounting that were experienced in 15 local authority areas in 2001, including Westminster, are not repeated."